Could brighter clouds be the answer to the problem of climate change? New research, published this week in Science Advances, shows that clouds formed by plankton - tiny organisms floating in the sea - are much brighter than those formed by pollution and could be used to help to manage the temperature of the Earth. 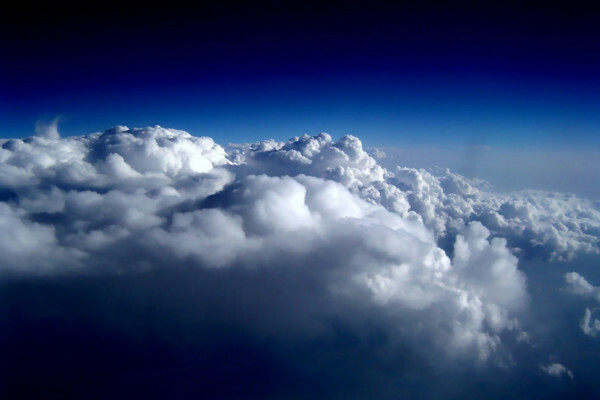 Clouds help to regulate the Earth's climate by reflecting sunlight back into space. Brighter, whiter clouds reflect more sunlight and keep the planet cooler. Understanding how these clouds form and what controls their level of brightness could lead to the development of 'cloud-whitening' mechanisms to combat climate change in the future. Daniel Grosvenor, from the University of Leeds, was part of a team looking at the Southern Ocean, the large remote area of water surrounding Antartica, to see how cloud formation there differed from that in more industrial areas. "The Southern Ocean is one of the most remote areas on Earth, so by studying cloud formation there we can get a glimpse of how clouds formed in the pre-industrial age," says Grosvenor. Current climate models are much weaker at modelling the climate of the Southern Ocean as less information is available about this area. The work of Grosvenor and his co-authors is helping to "fill in the gaps" and give us a better understanding of the baseline level of cloud formation before industrial factors came into play. "If we are to understand how humans have affected cloud formation, we first need to know how clouds form naturally," explains Grosvenor. In order for a cloud to form, the water droplets in the air require something to hold onto - a "seed particle". What the new study found was that, unlike the 50% of clouds in the Northern Hemisphere that form around particles of pollution, half of the clouds over the Southern Ocean are actually seeded by plankton and are correspondingly brighter. Marine life can aid cloud formation in two ways. First, phytoplankton (microscopic plants) emit gases such as dimethyl sulfide as a bi-product of photosynthesis. These aerosol gases act as the seed particles for cloud formation, much like pollutants do in more populated areas. The second method is directly through organic material that collects on the surface of the water and is whipped up into a bubbly scum. Tiny particles thrown up into the air by the waves act as seeds for cloud formation. The reason the clouds over the Southern Ocean are brighter is due to the make up of the water droplets inside them. Clouds reflect sunlight based on both the amount of liquid suspended in the cloud and the size of the water droplets. For a given amount of liquid, the cloud will look whiter, and therefore reflect more sunlight, if the water is distributed in a greater number of smaller drops. So a higher concentration of smaller water droplets makes for a more reflective cloud than a low concentration of larger droplets. "This has all sorts of geo-engineering applications," says Grosvenor. "One example would be to fertilise the oceans with iron, causing a phytoplankton bloom and as a result increasing the number of cloud forming seeds. A higher concentration of more reflective clouds could be used as a method to counteract global warming."